Easy, 20 Minute Vegan Pasta! You are going to love this healthy, easy vegan pasta! With a trick to creating glossy, restaurant-style pasta, this is a must save for quick dinners. You guys, this week. Wow. It’s clear that no matter what side you fall on, there is a lot of uncertainty. My Facebook feed has been flooded with responses to the week’s events, some in praise, many in disbelief, sadness and anger. I know that we cannot solve this situation with the same thinking that got us here in the first place. The temptation to engage in divisiveness and fear-speak is so strong; however, our work is to be present enough to respond with love, understanding and kindness. I know this isn’t the easy path. And yet, I keep coming back to the planet. We can’t afford to halt our progress against climate change. The debate is long over; the affects are real, and the window is increasingly closing for action. This isn’t hyperbole; this is terrifying. I spent most of yesterday thinking about my own future, one that I hoped would include a child in the next year or two. I’m wavering on the responsibility that comes with bringing someone into a world that won’t be as safe, abundant or sustainable as it was for my generation. How do we do this? I don’t know what our ultimate decision will be, but this is weighing so, so heavy on my heart. So, here’s what I’ve come to. I may not be able to affect change at a global level, but I can in my kitchen. We vote with our dollar; we vote with our fork. In addition to the horrific treatment of animals in the factory farm system, meat is also one of the biggest contributors to greenhouse gasses. Reducing consumption of animal products, even just a few days a week, has overwhelming benefit. 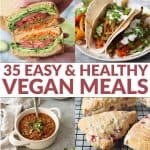 I’ve got hundreds and hundreds of 100% plant-based recipes on this site, and I vow to produce even more. I also want to help you enjoy more meatless meals. What resources do you need from me? Tips, how-tos? Let me know in the comments below. This pasta is my go-to meal for so many dinners. It’s vegan, loaded with vegetables and delicious. Plus, it’s ready in less than 20 minutes, perfect for any I’m so hangry moments. I used spinach here, because there’s no chopping involved and I always have it in my fridge, but feel free to sub in any green of your choice. Now, to make this pasta super creamy and delicious, I’m letting you in on a little secret. Forget the directions on the box and cook it this way: bring a large pot of salted water to a boil, add the pasta and cook for a little more than 1/2 of the recommended cooking time. For instance, if the spaghetti will be ready in 10 minutes, cook it for 6. 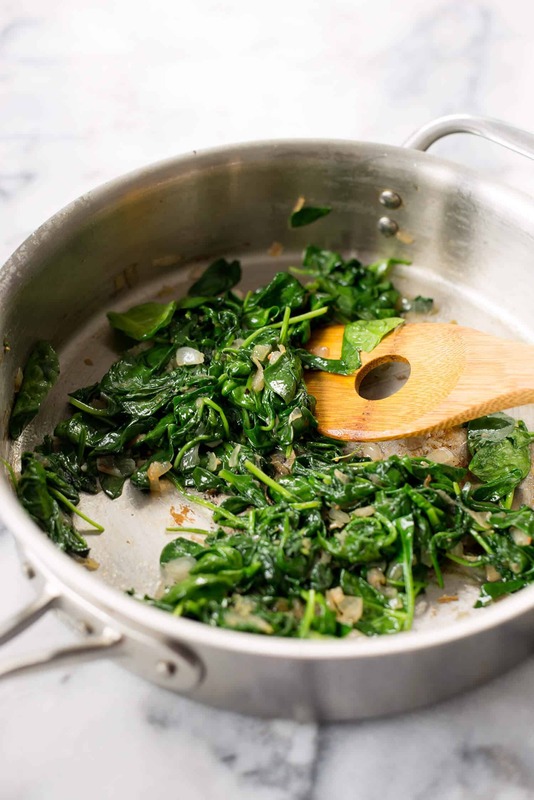 You’ll want your sauce already prepared, so I start cooking the shallots and spinach as soon as I put the water on. Then, add your not-quite-cooked noodles to the pot along with a ladle or two of pasta water. Increase the heat to high, and keep stirring as the noodles absorb the water. Add more water, a ladle at a time, until the pasta is cooked al dente. Doing it this way ensures that every strand will be coated in the yummy shallot-garlic sauce. It’s optional, but I like adding in a pat of dairy-free butter at the end (like Earth Balance) to keep things glossy and smooth. Make this vegan parmesan to sprinkle on just about everything. It’s amazing how much it tastes like regular parmesan cheese. Nutritional yeast can be found in most co-op/Whole Foods-like places (check the bulk section) or online. This is not brewers yeast, it’s nutty, sharp and very similar to cheese. You can store the leftovers in the fridge or freezer. We can do this. Sending you lots of love for your weekend ahead. 20 minute dinner. You are going to love this healthy, easy vegan pasta! Heat the oil in a large skillet over medium heat. Add the shallots and cook until soft and caramelized, about 5 minutes. Stir in the garlic, red pepper flakes and pinch salt/pepper. Meanwhile, add the pasta to the salted water and cook a little more than half of the recommended time. For instance, if al dente is 10 minutes, cook for 6. Add the slightly uncooked pasta to the skillet along with 2 ladles of pasta water. The pasta water has starches to help the sauce cling to the pasta, so don’t substitute regular water. Bring to a simmer and cook, stirring often, until the water has evaporated. Continue to add more pasta water, one ladle at a time (might only need 1-2 more) until pasta is al dente/cooked through. Stir in the parmesan cheese and season to taste, if needed. Made this tonight! So glad I found this site, everything looks so appealing. My non-vegan fiancé said this was one of the best things I’ve made! Hi Tina, any green could work! Perhaps kale or collard greens? Hi Ova, most dried pasta is vegan. Fresh pasta often contains eggs. My hubby and I loved it! A new favorite! Legumes are beans and dried peas! i am recently transitioning into vegan. i tried this recipie and added Morning Star chicken breasts and it is FANTASTIC!!! thank you so much for sharing. Hi Miz- Morningstar Chicken are vegetarian chicken breasts. Just made this easy, healthy dish. I used collared greens and whole wheat pasta (just because I had it laying around the house). Yummy! I am so happy that I found your page . doctor put me on a plant base diet . I am at a loss but I came across your page and looking forward to trying more recipes. That’s awesome your dr put you on a plant based diet! Can I ask where you live? So glad to find your site. My husband’s Dr. Put him on a plant based diet about a year ago. Dr. recommended ‘forks over knives’ cookbook. Meals are boring & require many ingredients & a lot of time to prepare … Not to mention the expense of the ingredients. So glad you found this! 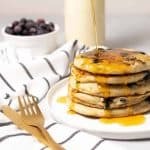 I’ve got hundreds of plant-based recipes on this site. While not all of them fit under the “Forks over Knives” category- you can always adapt them to your needs! Let me know if you need anything else. Holy crap!! I just made this and I am dying!! SO GOOD! I didn’t have shallots so I sub’d w/ green onions — so so good! Made this tonight and wow is it delicious!! I’m so excited to try this recipe and even more excited that you have more on here! I’m just now transitioning but I’ve been doing so much research I don’t even crave meat or dairy at all! Hope you like it! I’ve got LOADS of dairy-free recipes on here. Love how you respond to people who aren’t veg or those who are negative – super kind and respectful even when they aren’t. <3 I just love the maturity and professionalism c:. Anyways! 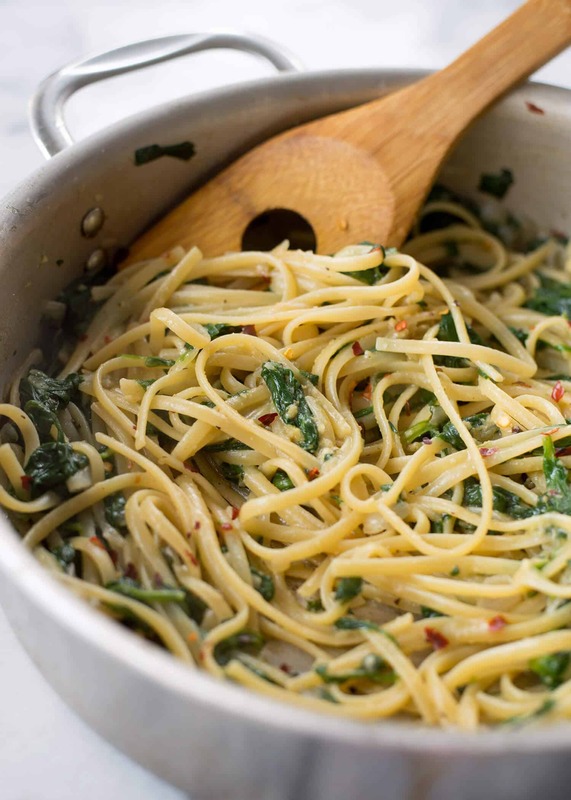 Planning to make this for lunch tomorrow as I'm dieting at the moment while being vegan and thought this recipe would be a great way to get my pasta fix without too many calories ^^. I'm thinking of adding a lemony flavor though with juice and zest…and I bet if I did have some, some vegan shrimp would be amazing with this! <3 Can't wait to make this and will try to report back when I'm done ^^. Hopefully it's not too dry as I'm always hesitant about pastas without "sauces"~. Yes! I hope you like it. And I think vegan shrimp would be great- one mentioned that he used vegan chicken strips in this and it worked well. You are essentially making a sauce using the pasta water-regular water won’t work the same way, so make sure you reserve some before draining the pasta. Let me know what you think! I have returned! Just made this this morning and split it up for breakfast and dinner portions. Everything was amazing! I halved the chili flakes as I didn’t really want any spice going on, and added the zest of a lemon and the juice of it to this mix. I don’t have any vegan parm so just used 1/4 cup of nutritional yeast and after some stirring with the pasta water sauce it became a creamy and lightly yellow colored sauce :D. Taste was AMAZING. 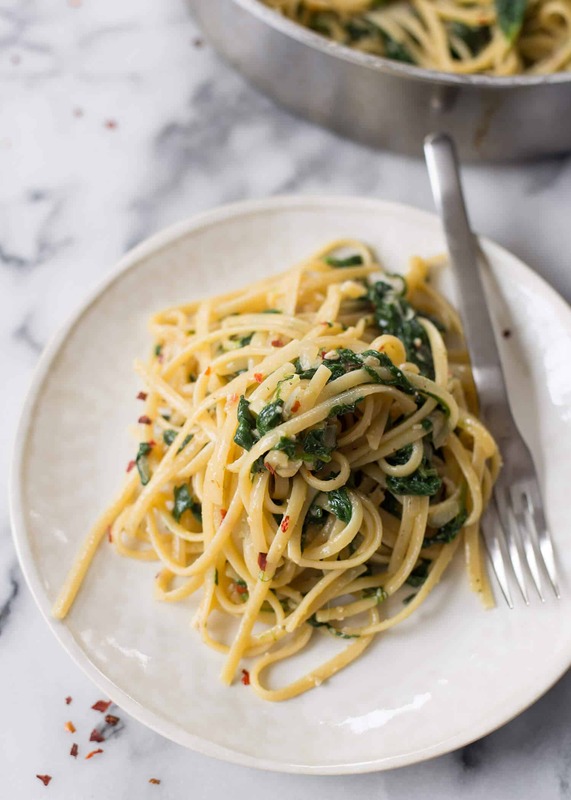 You think it’d be bland because there seems to not be too many ingredients but it somehow works and especially with the lemon it takes on this amazing lemony linguine flavor. Awesome recipe Alex!! I just tried this recipe and attempted to adjust ingredient amounts for a full box (14oz?) 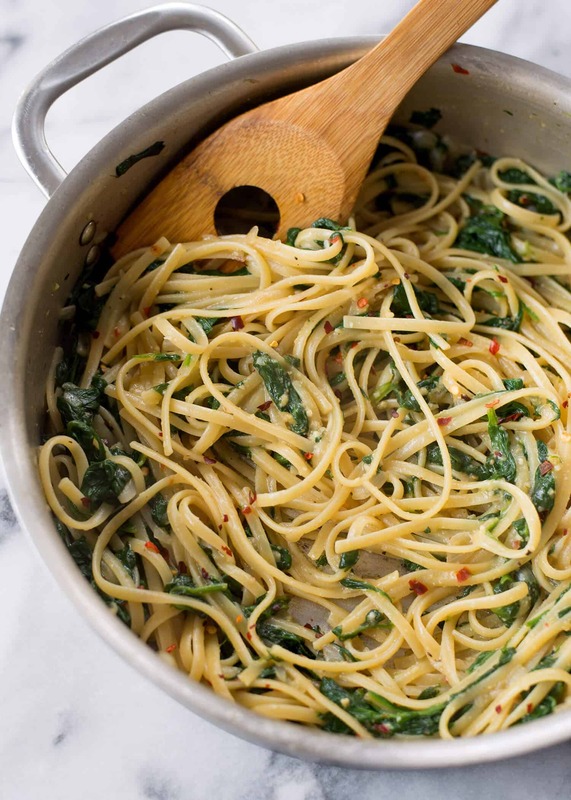 of angel hair pasta. It came out very dry, especially when I put the parm on. Is it possible I didn’t add enough water even though I added enough to cook the pasta through? I am definitely going to try this again but I’m not sure what to do differently. Hi Stephanie, if you try it again, I’d try with a spaghetti or linguine noodle instead of angel hair as that’s a fairly fine noodle and may clump too much when water is added. Did you add extra water after adding the spaghetti to the pan? Thank you! I tried it again with a spaghetti made from chickpeas and it turned out great! There just wasn’t enough of it 🙂 I don’t know why shallots make everything awesome, but they do. This was delicious! I added a little wine, vegan butter, and some white balsamic to the dish before adding the pasta and starch water. This has been my first vegan experiment recipe experience and YOUR RECIPE WAS DELICIOUS! Thanks for sharing. So what kind of linguine noodles do I buy? Regular in the box? Also where can I get dried red pepper flakes along with the sauce? Hi Keisha, yes- you buy dry linguine in the pasta section of the grocery store. You can also find dried pepper flakes in the spice section of the store. OH MY GOD, THIS WAS AMAZING! Only change i made was the addition of lemon juice & zest. I didn’t use the cheese substitute. Really delish! !